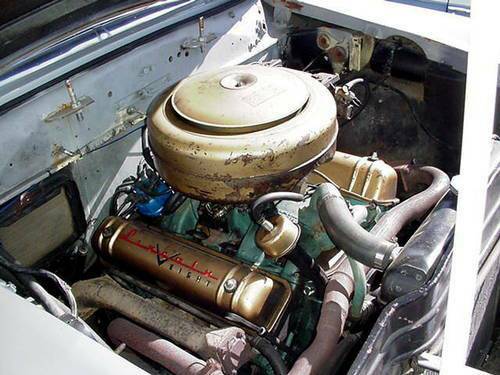 The 1960 version of Hot Rod Lincoln is sung by Johnny Bond and unlike earlier versions of the song, his hot rod Lincoln has 8 cylinders instead of 12. That is perfect for today's feature because we couldn't find a 12 cylinder hot rod Lincoln and had to settle for this V8 powered hunk of steel. 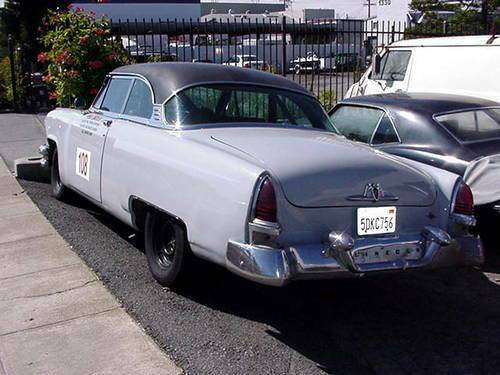 Find this 1954 Lincoln Capri Coupe for sale in SF Bay Area, CA for $11,500 via craigslist. Tip from Kaibeezy. If you don't stop drivin' that Hot Rod Lincoln". Not a good idea to drink when driving this Lincoln as its setup for Rally, tarmac, vintage, etc. The rollcage, 5 point harness and 32 gallon fuel cell make it ready for the next running of La Carrera Panamericana or Targa California. Not many details about the V8 under the hood are given, but it should be enough to make this thing put out some rooster tails in the dirt and make for a fun ride. Nice, doc. You put me right there. Amazingly, the original Hot Rod Lincoln that the song was based on still exists. It was sold this year at the Barrett-Jackson auction in Scottsdale for $106,700. It was built by Charlie Ryan who both wrote and originally recorded the song. You could buy 9 copies of the '54 Capri above for $107k but the history of the original HRL / Model A is priceless. Very cool car! I think I owned a Capri once in the 90s, and I'm pretty sure it was a Lincoln. Anyway I was just reading on bringatrailer how those guys actually had A Mustang Boss 302 TRAILERED to Oregon for an event instead of driving it. I guess I can see that, wanting to avoid the tedium of driving up highway 1 amidst the most beautiful scenery on Earth. I couldn't stand the annoying racket of solid lifters and steel headers and the clatter of all these cylinders going on at once either! Seriously. That's some car guys over at bringatrailer. One reader called them pussies for it, I guess they haven't had a chance to delete his comment yet. But what does that have to do with this here proud hunk of American iron you might ask? This: bringatrailer is like those bars where hipsters with waxed 'staches serve $18 artisan cocktails to a crowd of poseurs and wannabees chuckling knowingly over the 15th $35000 bmw 2002 of the quarter. DT is like your friendly neighborhood tavern where you chug a few Hamms while catching up with the guys. Nice cars that would actually be fun to own, no attitude and a sense of humor, what more can you ask? Thank you, Daily Turismo!